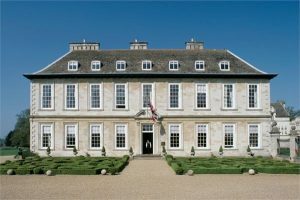 Boasting an extraordinary history dating back to the late 17th century, Grade I listed Stapleford Park is a prestigious venue licensed for weddings and civil ceremonies. 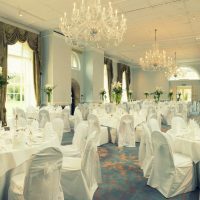 Majestically seated in 500 acres of Capability Brown landscaped grounds, the stately hotel provides a lavish backdrop for grand and intimate celebrations. With a choice of opulent rooms, beautiful outdoor settings and 18th century Church, the only limit to your celebration is your imagination. Take advantage of a breath-taking variety of historical features for your photographs including; grand staircase, domed roof Orangery and not forgetting the idyllic grounds. For those who want to extend their stay, why not relax in one of the 55 individually decorated bedrooms and suites. Sumptuously furnished, the rooms have been designed by a number of leading designers including Zoffany, David Hicks, Mulberry, Osborne & Little and Crabtree & Evelyn. Or for the ultimate relaxation pay a visit to the onsite spa which offers a wide range of treatments, therapies and a stunning indoor pool. 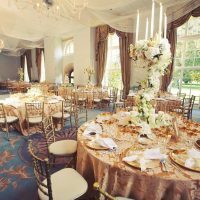 Accommodating up to 180 guests, the Grand Hall is elegantly decorated in neutral tones and features three dazzling chandeliers. Floor to ceiling windows provide ample natural lighting and lovely views overlooking the formal gardens. 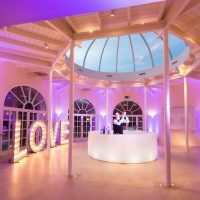 Adjoining the Grand Hall, the breathtakingly beautiful Orangery caters for up to 150 guests. Every little detail makes this octagon shaped room perfect for ceremonies. 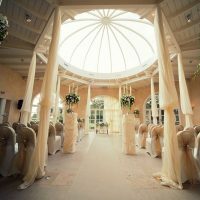 Declare your commitment under the elegant glass domed ceiling that suffuses the room with natural light. During fair weather, the French doors can be opened to enjoy access to the terrace and picturesque gardens. The Morning Room is ideally suited for intimate gatherings and classically decorated in Georgian style. Adjoining the Morning Room is the regency style Gilt room. Both spaces benefit from natural light and sensational views of the grounds. Suitable for up to 26 guests the Harborough Room is one of the most richly decorated and lavish settings at Stapleford Park. Scarlet Gainsborough silk wallpaper and exquisite chandeliers create an opulent ambiance that is perfect for weddings and special celebrations. Situated adjacent to the Harborough room, the Billiards room accommodates up to 16 guests and is perfect for smaller celebrations. Located in the oldest part of the house the Old Kitchen served as the original kitchen. The stone walls, vaulted ceiling and grand feature fireplace create an atmosphere from a bygone age for up to 36 dining guests. Blessings can be held in the 18th century St Mary Magdalene church. To help couples keep the planning stress free and simple Stapleford Park offers a range of wedding packages to suit a wide range of budgets and requirements.